Banksia nivea, previously Dryandra nivea. Photo from here. Adam Yates has requested that I do a post on the relationship between Banksia and Dryandra, two Australian genera (but read on) of the plant family Proteaceae. 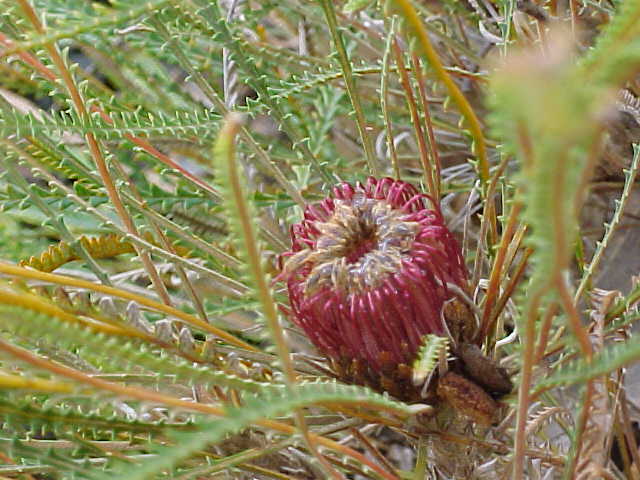 Banksia has a generally coastal distribution around Australia, but is conspicuously absent through the Nullarbor region and northern Western Australia (i.e. where the coast is driest). Dryandra is restricted to the south-west corner of Australia. A close relationship between the two genera has long been accepted, supported as it is by features including the bearing of flowers in compact inflorescences (cone-shaped in Banksia, capitate in Dryandra) and production of seeds with a hard bony endocarp. These seeds are contained in bivalved woody follicles, only a relatively small number of which develop to maturity in any given inflorescence. In most cases, the follicles do not open at maturity but remain closed until heated by the passage of a bushfire; only after the fire do they open to release their seeds. 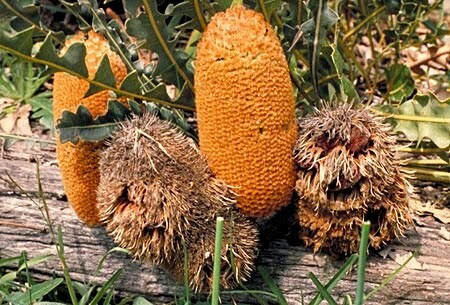 The appearance of remnant Banksia cones with the protruding follicles resembling eyes or gaping mouths has long affected Australian folklore, with the most familiar example being May Gibbs' 'bad banksia men'. The banksia men, villainous characters from May Gibbs' Snugglepot and Cuddlepie books, in their natural habitat. However, recent years have seen the species of Banksia involved in a greater controversy than the mere kidnapping of gumnut babies: the kidnapping of an entire genus. Molecular studies have shown that Dryandra is phylogenetically nested within Banksia, rendering Banksia in its familiar sense paraphyletic (Mast & Givnish, 2002; Mast et al., 2005). This has lead to the formal synonymisation of the two genera by Mast & Thiele (2007), an action that has incited its fair share of grumbling among Australian botanists and horticulturalists. However, the alternative—dividing Banksia into multiple genera—would have required establishment of a number of new genera as the type species, Banksia serrata, is among the closer relatives of Dryandra. Also, these new genera would probably not have been easily distinguishable morphologically. Banksia gardneri, showing both new and persistent cones. Photo by Brian Walters. Though initially incited by molecular studies, the paraphyly of Banksia excluding Dryandra is also supported by morphological factors. Mast & Givnish (2002) supported a division of Banksia into two clades which Mast & Thiele (2007) recognised as the subgenera Banksia (including Dryandra) and Spathulatae. Members of Banksia subgenus Banksia have beaked follicles while the follicles of Banksia subgenus Spathulatae are unbeaked. Also, most members of subgenus Banksia have the stomata on their leaves recessed into deep pits, though this feature has appeared apparently independently in one small subclade of subgenus Spathulatae (most of which have more superficial stomata). The sinking of the stomata into pits (an adaptation for living in arid environments) is also supported as a derived feature by the fossil record of Banksia sensu lato, the earliest known representatives of which in the Late Palaeocene lack such arid adaptations (arid-adapted banksiines are not known until the Late Eocene). 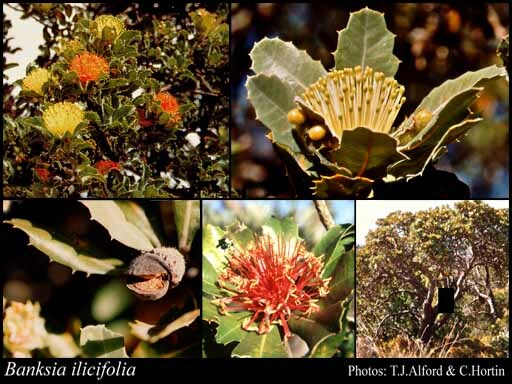 Images of Banksia ilicifolia, a short-coned potential relative of Dryandra from south-western Australia. Photos by T. J. Alford & C. Hortin. Within Banksia subgenus Banksia, the clade now known as Banksia series Dryandra falls within a clade also containing other south-west Australian species of what have previously been regarded as 'series Banksia' and 'subgenus Isostylis'. The latter are interesting in this regard as having particularly short cones, and had been compared to Dryandra even when the two were regarded as separate genera. But while the short-coned banksias are close to series Dryandra, they do not necessarily form an exclusive clade with them, so it is uncertain whether their short cones represent a transition between the normal Banksia cone and the capitate Dryandra inflorescence, or whether they have shortened convergently. Mast, A. R., & T. J. Givnish. 2002. Historical biogeography and the origin of stomatal distributions in Banksia and Dryandra (Proteaceae) based on their cpDNA phylogeny. American Journal of Botany 89 (8): 1311-1323. Mast, A. R., E. H. Jones & S. P. Havery. 2005. An assessment of old and new DNA sequence evidence for the paraphyly of Banksia with respect to Dryandra (Proteaceae). Australian Systematic Botany 18 (1): 75-88. Mast, A. R., & K. Thiele. 2007. The transfer of Dryandra R.Br. to Banksia L.f. (Proteaceae). Australian Systematic Botany 20 (1): 63-71. "Molecular studies have shown that Dryandra is phylogenetically nested within Banksia, rendering Banksia in its familiar sense paraphyletic (Mast & Givnish, 2002; Mast et al., 2005). This has lead to the formal synonymisation of the two genera by Mast & Thiele (2007), an action that has incited its fair share of grumbling among Australian botanists and horticulturalists. 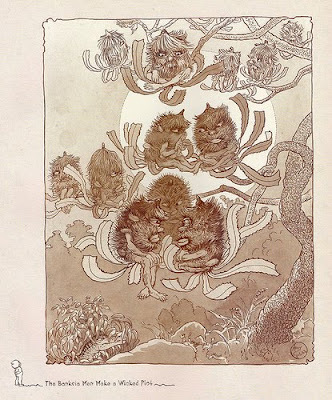 However, the alternative—dividing Banksia into multiple genera—would have required establishment of a number of new genera as the type species, Banksia serrata, is among the closer relatives of Dryandra." Well. That is not the alternative, it's just an alternative. Another is just to leave well alone and accept that Banksia is paraphyletic. After all, if the conclusions of the recent analysis are correct, it's always been paraphyletic, and that fact hasn't hurt anyone up till now. Genera Are Not Clades. They are an entirely different kind of thing. Forcing monophyly is like forcing skateboards to have headlamps. By the way -- can someone please explain to me WHY IN THE NAME OF ALL THAT IS RATIONAL THIS BLOG DOESN'T ALLOW THE [blockquote] TAG TO BE USED IN COMMENTS? ARGGGHHGHGHG! Genera Are Not Clades. They are an entirely different kind of thing. Forcing monophyly is like forcing skateboards to have headlamps. Entirely agree with you, in theory. Personally, I think the binomial system is becoming more and more untenable over time, but I can't see it going away any time soon. As for not allowing blockquotes: it's a Blogger thing. Nothing I can do anything about (at least, not with my exceedingly limited computing knowledge). "What the binomial system really is, is a crutch to help the human mind remember lots of species names. If we had minds like computers, we could give each species a really arbitrary unique identifier and arrange them at will into genealogical trees. But instead, it helps our overburdened memory if a species has a unique name part of which is shared with similar organisms. This would work well, I think, if we had long ago decided that these groupings would be based on purely superficial similarities. Trying to use phylogenetic relationships as the criteria for the groupings is a problem because not only do the frequent renamings undermine the memory-saving function of the system, but it doesn't even suit phylogeny very well. It's an awkward hybrid of, as Mike says, two "entirely different kinds of thing"."